What is Depo-Medrol (Lignocaine HCL/Methylprednisolone Acetate) used for? 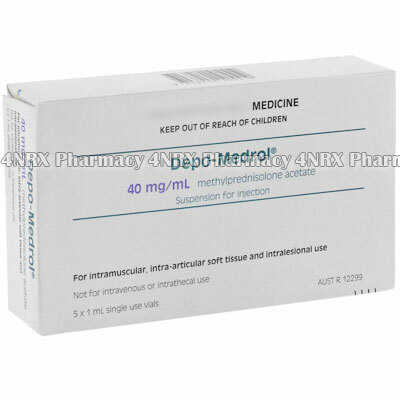 Depo-Medrol (Lignocaine Hydrochloride/Methylprednisolone Acetate) is an injectable medication used to treat patients suffering from arthritis or other inflammatory joint disorders. It contains a combination of an anaesthetic and steroid that operate by reducing pain and swelling to allow more comfortable movement with a wider range of movement. Your doctor may also prescribe the use of this medication for the treatment of other unlisted conditions. How should I use Depo-Medrol (Lignocaine HCL/Methylprednisolone Acetate)? Depo-Medrol (Lignocaine Hydrochloride/Methylprednisolone Acetate) should be used exactly as prescribed by your doctor to ensure the safest and most effective results from treatment. Your individual instructions will be determined by your age, weight, current health, the condition being treated, and the severity of your symptoms. The injection is normally administered by your doctor or another fully trained professional, but you may be required to perform the injection yourself in some rare cases. Make sure you are fully instructed in the correct procedure to prevent health problems from occurring. Sterilize the needle and the injection site, collect the prescribed amount of solution into the syringe, and eliminate any air from the syringe by holding it vertically, tapping it, and pressing down on the plunger until a small amount of medication is released. The injection may now be performed in the affected joint. Always observe the medication prior to use to make sure it is not cloudy or discoloured as this may indicate contamination. Ask your doctor any questions you have about the medicine before beginning use to prevent any unexpected health problems from occurring. What are the side effects of Depo-Medrol (Lignocaine HCL/Methylprednisolone Acetate)? Stop using the medication and contact your doctor as soon as possible if you encounter any intense or worrying symptoms such as low calcium levels, low potassium levels, severe depression, intense back pain, trouble breathing, blurry vision, blood appearing in the stools, or seizures. These conditions may require reduced dosages, application frequency, or emergency medical attention in serious cases to prevent further health complications from occurring. Do not use Depo-Medrol (Lignocaine Hydrochloride/Methylprednisolone Acetate) if you are pregnant, breastfeeding, or have a widespread infection. Do not inject the medication into a vein, connective tissue, or the joints of the spine. Also inform your doctor if you have epilepsy, glaucoma, a history of tuberculosis, herpes, low potassium levels, hypotension, hypothyroidism, ulcerative colitis, osteoporosis, inflammatory bowel disease, heart failure, myasthenia gravis, liver cirrhosis, peptic ulcer, liver failure, or reduced kidney function. These conditions may cause unexpected health problems requiring special adjustments to your regimen. Strictly use Depo-Medrol (Lignocaine Hydrochloride/Methylprednisolone Acetate) as prescribed and follow all instructions provided by your doctor. Safe, suitable, and optimum dosage can vary and is dependent on the patient`s health and medical history, as well as the condition you are treating. Depo-Medrol (Lignocaine Hydrochloride/Methylprednisolone Acetate) may not be safe or suitable for all patients. Always ensure your doctor is informed if you are pregnant or breastfeeding, using any other type of medication (including non-prescription medicine, vitamins, and supplements), as well as if you have any allergies, other illnesses, or pre-existing medication conditions.